Spiritual Vigor: Here’s The Biggest Problem In American Government. No One's Going To Deal With It. On Monday, The Wall Street Journal reported on a development students of American governance have known about for years, but politicians have studiously avoided doing anything about: the United States’ debt will cost us more in the near future than our own national defense. Thanks to the weakness of the global economy in the aftermath of the 2007-2008 financial crisis, tremendous appetite for American debt shielded us from the fallout from our $20 trillion debt – but that could soon be ending. When it does, there will be fiscal hell to pay. The Congressional Budget Office estimates interest spending will rise to $915 billion by 2028, or 13% of all outlays and 3.1% of gross domestic product. Along that path, the government is expected to pass the following milestones: It will spend more on interest than it spends on Medicaid in 2020; more in 2023 than it spends on national defense; and more in 2025 than it spends on all nondefense discretionary programs combined, from funding for national parks to scientific research, to health care and education, to the court system and infrastructure, according to the CBO. In the early 1990s, President George H.W. Bush agreed to tax hikes that killed his political career thanks to the burdens of the national debt. President Trump is highly unlikely to do the same – and neither are Congressional Republicans, whose only major legislative achievement is the tax cuts passed last year. Moreover, Democrats have no interest whatsoever in paying down the national debt. In fact, it’s exactly the kind of lever they’re looking for to raise taxes should they gain office in the near future. Instead of blaming the actual culprit of our national debt – out of control entitlement spending – Democrats have spent the last decade falsely blaming the wars in Iraq and Afghanistan and tax cuts. They’re currently proposing an exponential expansion of our spending on entitlements with programs like “Medicare for All” and free college tuition, which won’t be paid for by anything other than a tremendous middle class tax hike. Democrats want Nordic social democracy; they’re going to have to push Nordic tax rates in order to achieve it. Debt as a share of gross domestic product is projected to climb over the next decade, from 78% at the end of this year—the highest it has been since the end of World War II—to 96.2% in 2028, according to CBO projections. By way of contrast, Spain, a country with serious fiscal problems, stood at debt-to-GDP of 99.6 percent last year. Now, some commentators have been sanguine about the possibility of such debt. They say that a little fiscal handiwork will do the trick – simply cut the budget a little, revert to strong economic growth, and the rest will be fine. But that’s ignoring the structural problem of our debt, which is far more ruinous than it was in 1991. We can only stave off serious restructuring for so long. But there’s no political benefit to staving off the debt for either side. Republicans lose ground when they talk about restructuring entitlements; Democrats want to expand entitlements. The American public is simply unready to talk about doing what we must in order to ensure America’s continued economic growth and strength, particularly at a time when our population is rapidly aging. That’s why Speaker of the House Paul Ryan (R-WI) will leave Congress with his chief political ambition, entitlement reform, unfulfilled. What will the consequences be? The continued Europeanization of American politics, as taxes and spending inevitably rise in tandem. The only difference between the parties will be Republican calls for austerity measures at the margins, and Democratic calls for massively higher taxes and higher spending. We’ve been playing a pyramid game. In the next decade, that pyramid is going to cave in on us. The argument here suffers from a bit of confirmation bias. In particular, pay attention to the assumption that the "debt" must be "repaid". Let's focus, in particular, on the "debt" allegedly owed by the Federal government to the Federal Reserve Banks. The New York FED has admitted, in an annual report, that more than 90% of its earnings in one year derived from "interest on government securities". The Federal income tax is collected to pay that very same "interest". However, there is no Act of Congress creating a specific liability for those taxes. Instead, the IRS attempted to create that "liability" with a Regulation, but the Supreme Court has already held -- correctly -- that a tax liability may NOT be created solely by means of Regulations published in the Federal Register. The United States has already declared insolvency as to obligations it allegedly owes to the FED, and that declaration invoked the AUTOMATIC STAY authorized by Federal bankruptcy laws. Conclusion: the FED is IN DEFAULT and IN CONTEMPT of that AUTOMATIC STAY, and has no claim on any more Federal income taxes i.e. "interest on government securities". As such, there is no legal requirement for the Federal government to continue paying any more "interest" on "government securities" of which the FED banks are holders in due course. If the Federal Gov't defaults or flat out refuses to pay in any way shape or form, will this damage the country's ability to borrow for operational costs? The country will never run on it's own generated income as that is likely economically unfeasible for some arcane but likely nascent reason. How much does the government "fear" not being able to borrow as compared to the Banks fear of and inability to continue to line their pockets? Who would blink first I suppose. How important is it to pay the debt, especially if it is only 3% of GDP on going. Does it serve the country to make its own money? Is it a responsibility that is best managed by another agency? It seems obvious that the government printing its own value based currency, perhaps founded on the economy to provide worth to the "money", but is it? Are there real obstacles to making ones own money? The obvious says yes, but are there real pitfalls to not having an arms length distance from the capital a country uses? And is this a calculation that is taken into account by the economic scientists that engineer this? I enjoy the idea of the country being taken hook line and sinker in a never-pay-it-back scenario as it seems monstrously unfair, but is it? > If the Federal Gov't defaults or flat out refuses to pay in any way shape or form, will this damage the country's ability to borrow for operational costs? refuses to pay ALL of its debts. I believe you should re-phrase your question in light of the fact that the FED is only one of many creditors. the United States as a worldwide leader in repudiating this SCAM. stronger position to re-organize all of its other debts. > The country will never run on it's own generated income as that is likely economically unfeasible for some arcane but likely nascent reason. How much does the government "fear" not being able to borrow as compared to the Banks fear of and inability to continue to line their pockets? I don't believe the government maintains any real "fear"
and out in the open for all to see. printing U.S. Notes at any time it wants to do so. > Who would blink first I suppose. How important is it to pay the debt, especially if it is only 3% of GDP on going. annual earnings of the Federal Reserve Bank of New York. the FED's earnings will decrease accordingly. > Does it serve the country to make its own money? why JFK wanted the nation to switch to U.S. Notes. > Is it a responsibility that is best managed by another agency? > It seems obvious that the government printing its own value based currency, perhaps founded on the economy to provide worth to the "money", but is it? Are there real obstacles to making ones own money? 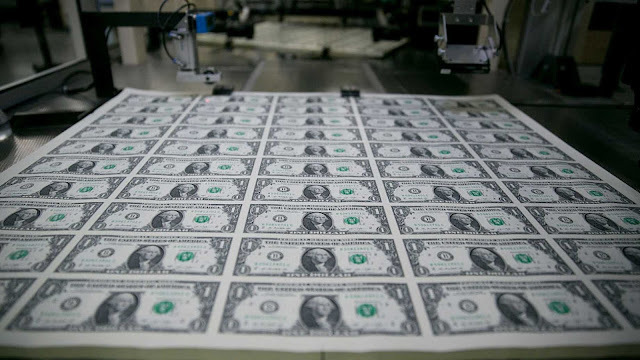 to resume printing United States Notes. > The obvious says yes, but are there real pitfalls to not having an arms length distance from the capital a country uses? you place great value in the so-called "independence"
expense of the American people. > And is this a calculation that is taken into account by the economic scientists that engineer this? most conducive to promote the general welfare. > I enjoy the idea of the country being taken hook line and sinker in a never-pay-it-back scenario as it seems monstrously unfair, but is it? by the sheer amount of Federal "income taxes"
people under false and fraudulent pretenses. implementing Regulation at 26 CFR 1.1-1(b). unconstitutional for that reason also. Maybe print "United States Notes", debt free money issued directly by the US Government and replace the "Federal Reserve Notes" issued by the private central bank? Much appreciate the earnest reply, I have objected to the structure since becoming aware of it some time ago. It is so glaringly obvious to most who would investigate it, it has always struck me as sad and odd that it should have been more directly addressed by now. Perhaps the information has not yet permeated the public deeply enough as yet. I laud those who uncovered this in the days sans internet. I see there is much scrambling inside the beast to bolster a wall against changing the present state. Were it to be addressed directly, just how much damage would be done to the country while the corruption by the vipers that control the money supply was being cut out. The market manipulations go back a long way to the first forced bank runs of 1907 and 1912 that helped usher in the idea of a 'Central Bank'. They are so deeply embedded in the spine of the thing now that ejecting them would come at cost.